Pippi Longstocking returns to fix everything in the second volume of comics written by the series creator, Astrid Lindgren, and illustrated by the original Pippi artist, Ingrid Vang Nyman. It is Pippi's birthday, which means there is a lot of fun to be had! Join Pippi, Annika, and Tommy in their adventures on board a ship, hosting farewell parties, and visiting with Pippi's father, the island king. 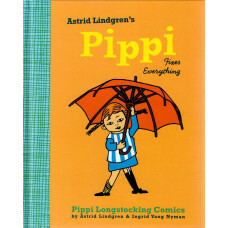 Bright colors, zany illustrations, and, of course, an irrepressibly joyful, strong-willed heroine: Lindgren and Vang Nyman's brilliant work guarantees that Pippi Fixes Everything will become an instant classic for young and old alike.